Betcha you'll eat these brusels sprouts. We're Irish so we threw in some potatoes in this mix. We really got into business when we added giardiniera oil (we used Alpino's hot) and Pinch Spice Market's Buffy Slayer Helper (which is garlic x10 plus a little heat). We ate it with a side of succotash to cool of the awesome heat radiating off these bad boys. This recipe serves 2-3 people. Heat giardiniera oil on med heat. 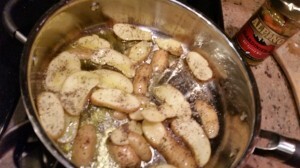 Add potatoes, top with pepper and cook until browned, about 7-10 minutes. 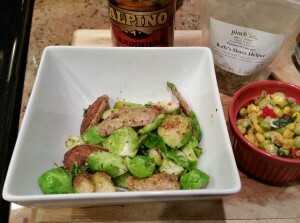 Add brussels sprouts, olive oil and Buffy's Slayer Helper (or the garlic substitute). 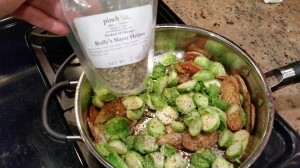 Stir for 5-7 minutes until sprouts are browned. Take off heat, sprinkle a little salt on top and enjoy.